Generally speaking, Mahlers late symphoniesexcept for No. 8, which is extremely popular because of its splendid exhibitionism, despite its complexityare not only unpopular but also extremely difficult to bring off well, and the Seventh has always been considered the most difficult of all. Only a handful of conductors, among them Kubelk, Abbado, and Boulez, seem to have managed to solve this hardest of Mahlers musical puzzles. All three of the conductors named were able to do so because they reveled in its grotesqueries, yet were able to knit its disparate elements together, and even they do not always succeed (or succeed equally) in each of the performances they lead. As I write these introductory words, I am in fact listening to Rafael Kubelk conduct the symphony, the performance of February 28, 1981, with the New York Philharmonic that is generally considered to be his finest. All the swirling details of the score are brought out clearly, yet each and every element is knitted together splendidly and woven into a tapestry that touches the spirit and evokes a world of different moods. Kubelks tempos, in this performance especially, were rather slow, yet they never sound slow; he maintains momentum, no matter how convoluted the texture or how difficult the rhythms, and sustains tension despite his slowness. Switching to Schwarz, one hears a performance 10 minutes faster than Kubelks. There is less rubato, more of a linear concept. It is played with great feeling, howeversomething I did not hear in Schwarzs readings of the First and Ninth symphoniesand although not quite as fiery as Abbados second, more successful, recording, it works very well. Like Kubelk, Schwarz revels in the musics grotesqueries, albeit in stricter tempo. 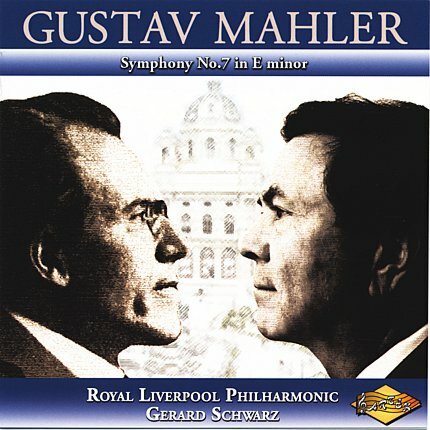 There is sufficient relaxation in the soft string passages to offset this drama, and the Royal Liverpool orchestra responds with verve and great feeling to Schwarzs every shift of mood. The first Nachtmusik movement plays off the dark and light elements in perfect equilibrium. The lyrical middle section has just the right tenderness and gemtlich for the music. The music singsand how it sings! One almost expects a soprano to come swooping in at any moment. The Scherzo has proper bounce and swagger, with a light touch that makes the odd violin glisses sound like aerial acrobats riding above the ebb and flow of the music. There is also a touch of humor, so important in this score. The second Nachtmusik continues this mood in a most charming vein. In the finale, Schwarz pulls out all the stops: the music leaps from the speakers and grabs you by the shoulders. There is an almost Baroque feeling to the counterpoint, though dressed in modern harmonic clothing, that Schwarz, an expert Baroque conductor, understands very well. Gerard, you scored a hit with this one! The sound quality is nothing short of fantastic. Five stars, easily.